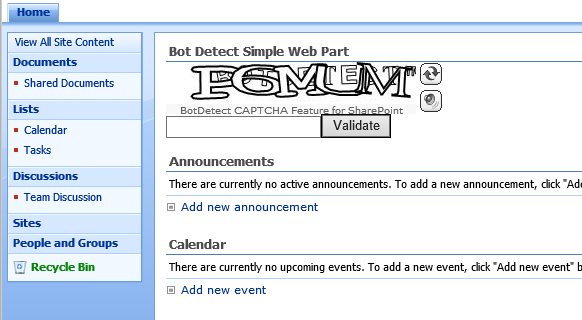 This article describes steps for creating a SharePoint Web Part using the BotDetect ASP.NET CAPTCHA control. It is a very simple Web Part that allows you to validate user input, comparing it to the code shown in the CAPTCHA image. In this article we assume that you are running Visual Studio 2008 or 2010 (or newer) on a server running WSS (Windows SharePoint Services) or MOSS (Microsoft Office SharePoint Server) 2007. Start by downloading the sample SharePoint CAPTCHA Web Part project. If you want to use this simplified Web Part example in your SharePoint website directly, you just have to build the project and follow steps 9-12. Steps 1-8 describe how the example Web Part project was created, and you can follow them if you want to create your own CAPTCHA Web Part — and make any code changes your SharePoint projects might require. Type "BotDetectWebPart" as the name and specify the location for the project files, and then click OK.
To create a Web Part, you need to add a reference to the Microsoft.SharePoint, System.XML and BotDetect (.NET 3.5) assemblies. If you want to reference the BotDetect Captcha control from an anonymous SharePoint site's Binfolder, the IIS anonymous access user account (IUSR_) should be granted Readpermissions to Lanap.BotDetect.dll. Alternatively, you could reference the BotDetect.dll assembly from the GAC. In "Choose a strong name key file" choose ""
After you complete the previous steps, you can define the logic and rendering for your Web Part. We are going to add a BotDetect.Captcha object (displaying the CAPTCHA image), a TextBox (entering the CAPTCHA code), a Button (invoking CAPTCHA validation), and a Label (displaying the CAPTCHA validation result). A Web Part Definition file (.dwp) file is a simple XML file that contains property settings for a single Web Part. To import your Web Part into a Web Part Page, simply upload the .dwp file. After uploading the Web Part, you can display the Web Part by dragging it into one of the zones of the Web Part Page. You can download a example web.config file here. To deploy your Web Part to a SharePoint site, copy your web part's assembly to the global assembly cache folder at C:\windows\assembly. To use and test your Web Part, import it into a Web Part Page on a server running WSS (Windows SharePoint Services) or MOSS (Microsoft Office SharePoint Server) 2007. Open a Web Part Page on your server. Select Edit Page from the Site Actions menu in the upper right corner of the page, and click Add a Web Part in one of the zones. Browse to the location of the BotDetectSimpleWebPart.dwp file, and then click the Upload button. After uploading, the page will refresh, and "My Simple Web Part" should be displayed under Imported Web Part. Drag the icon next to "Bot Detect Simple Web Part" to a zone on the Web Part Page.